Yesterday afternoon (23/6), I went on a `whistle-stop` recording tour for diurnal moths in SE Carmarthenshire, visiting Morfa-uchaf (just N of Ferryside), Ferryside itself, and the Kidwelly Quay area. I also ventured up to Mynydd y Garreg to search the rocky heathery areas etc. Not much was seen at all localities in spite of much sweeping and searching, with moths being `thin on the ground` due, I suspect, to the rather warm, bright and breezy conditions. Also, yesterday evening, I briefly visited the North Dock dunes at Llanelli but had to leave before dusk proper, again resulting in few records. Above: looking across the Tywi towards the Llansteffan, `mothing territory` of Mel Jones and Dai Stacey. A single silver y was on the red valerian in the foreground and a solitary but robust plant of sea-kale Crambe maritima growing close-by (Carmarthenshire`s only plant of this rare species), had a diamond-backed moth resting on it. Above: immediately north of the yacht club and railway station at Ferryside is a narrow band of sheltered dunes, where among the rest harrow swathes, the first individuals of the crescent plume Marasmarcha lunaedactyla were emerging, new for 2016. The individual shown above was actually photographed at the North Dock dunes yesterday evening. 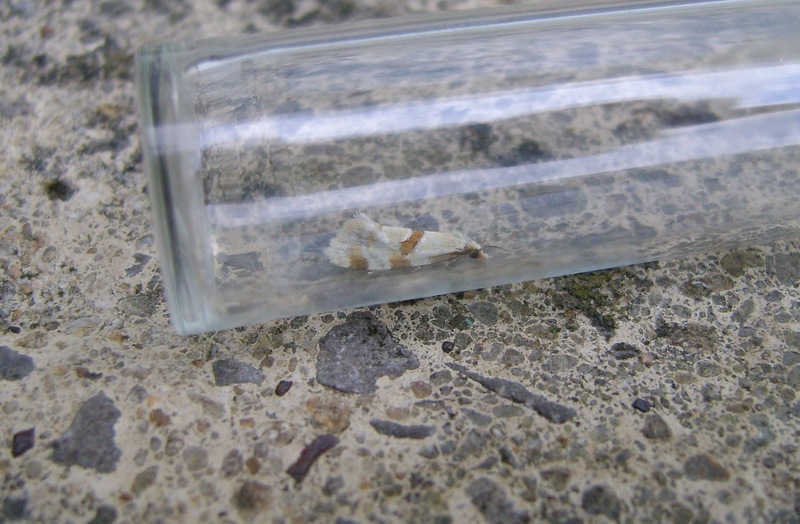 At Ferryside, I also swept an individual of either Monochroa tenebrella or Eulamprotes unicolorella. These species are very similar and both their food-plants were present - therefore a specimen has been retained. Both the above dune area and Morfa-uchaf (dune grassland and saltmarsh transition) would benefit from a dusk survey but finding time is the perennial problem. Whilst at these sites, I searched for mayweed plants but none were seen at Morfa-uchaf, though some were at Ferryside itself; no chamomile shark caterpillars were found. If moths were in short supply at all the sites visited (though a few useful records were made), other invertebrates were of interest such as the (quite common) Philonicus albiceps robberfly at Ferryside and the soldierfly Oplodontha viridula at Morfa-uchaf. Also at the latter site, three individuals of the beetle Nacerdes melaneura (the `wharf borer`) were found under logs on the driftline - it is similar, at first glance, to the common soldier beetle Rhagonycha fulva which, of course, occurs typically on flowers rather than under wood. Finally, one moth that was swept is shown below. Is it Aethes cnicana please? Yes looks good for cnicana.